Syria. Bethlehem. 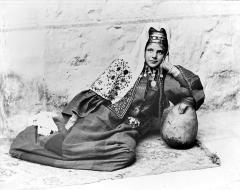 Girl seated on rug with elbow resting on a earthen water jar, dressed in Bethlehem holiday attire, jewels and embroidered headgear, (ca. 1899).